Did you know, over 90% of successful network security breaches happen in less than a minute? However, most go undiscovered for weeks. This is a scary reality. Network security breaches can happen to anyone. If your business stores sensitive customer data, a breach could have a significant, negative impact on your reputation. Just think back to all the high profile data breaches that have happened recently. If Yahoo, Marriott, Uber, and Facebook are vulnerable, the majority of small businesses are as well. IT departments often are responsible for protecting large enterprises. However, small businesses have to take matters into their own hands. 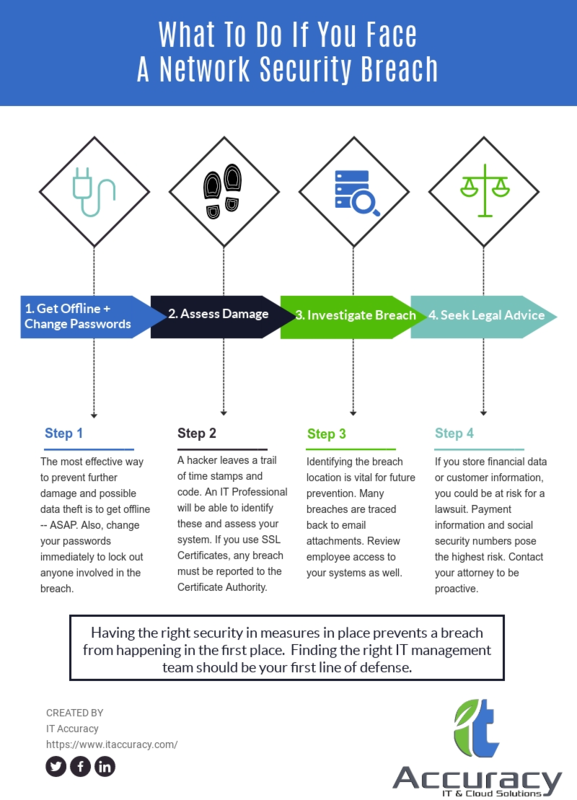 While we have 4 tips to help recover from a data breach, the best action step you can take is to be proactive! Managed IT Services can provide comprehensive protection and support for all your IT needs.